Antiques challenge. Experts James Braxton and Catherine Southon compete against each other in a Belgian market to see who can bag the best bargains and sell them on for a profit. Browse content similar to James Braxton v Catherine Southon - Foreign Antiques Market. Check below for episodes and series from the same categories and more! for a Belgian bargain battle. What on earth have I got myself into? See, old Bingo Brackers, he's sent me up here. I think he may have sent me on a wild goose chase. Why aren't they eating it? What's wrong with my food? this time with funny accents. and are heading to Belgium. and fight it out to be crowned king of the continental collectibles. On one side is a smooth-talking saleroom superstar. A man who will let nothing hold him back in the pursuit of profit. I've found a Holy Grail. straight from the Garden of England. This brainy beauty gets the dealers eating out of the palm of her hand. It's auctioneer extraordinaire, "Canny" Catherine Southon. Once more unto the breach, dear friend! to a charity of their choice. So, let battle commence. -James, good to see you. -Very good to see you. Early birds here. -Well, just once, yeah, for a day. It's more than I have. so I must be benevolent and I will show you the way. How's it set up? Is it quite posh? Is it quite rough and ready? It's all rough and ready, it's all on the pavement. they come up here and it loops all the way around the town. Our £750 will go a long way. I love it like that, that means it's cheap. We'll find bargains. We are going to find bargains. So, James, where would you suggest I started? I think you should start from the start, which is down there. -And I'll go in reverse. -OK. And we might meet up for a coffee. and heads straight to the town square. But hang on, he's not being benevolent! and I think there are more people set up here. so I've got first mover advantage. opposite side of the market, leaving him a clear run at the good stuff. But never fear, Catherine's got a plan of her own. spending just a few euros here and there. I want to spend low amounts, maximise my profit. So I'm going in for the kill. Mm, the kill! She's talking tough! He's first to swoop in on a deal on a rather risque painted door. What is your price on it, Peter? And that is the palette. -What, the palette came with the door? Would you do it for 200? So James splashes out just under £164 for the door. Has he been seduced by a naked lady? Mmm? This is probably not one of the easiest things to resell. It's rather fun, because it's a door. it looks like some sort of weird sort of gargoyle, doesn't it? I'm looking for an artist without a bathroom door. Yes, nothing like a challenge, eh, old chap? Bingo's on a roll, as he spots an unusual-looking item. This is the interesting thing with all these items. What would you use it for? It must be made for a purpose. -Meilleur prix, c'est cinquante. 50. That would look beautiful polished up. But he doesn't splash the cash. Has Sir Braxton lost his nerve? Come on, Bingo, it's not like you to dally! You always get a bit anxious after ten minutes of not buying anything. You think, is that the end? You need to keep buying in this game. Buy now, worry about selling later. to put her "spend fast and pay low" strategy into action. So here, we've got a lovely, lovely little apothecary cabinet. That's medicine to you and me. carried this with his little bottles and potions and what-have-you in. and little drawers for pills. 255. James said it was cheap here. My last word is 250.
but Catherine thinks it's just what the doctor ordered. I'm chuffed beyond belief with this apothecary cabinet. I've seen a lot of these in my time, but nothing as good as this. This one has these fantastic big hinges on. And I would say this dates to around 1840. The problem is, it was quite expensive. I think it's got great potential. Canny Catherine is oozing confidence today. But what of Bingo? Surely he's still not pacing the streets? Has his strategy of staying up this end of the market backfired? Not a lot of stallholders have still set up here. but I just want something to catch the eye. and now, it seems that all that legwork has worn him out! Ah! That is so comfy. -How much is this? Do you know? That's the owner. 25 I think is possible. -25 you think is possible? -I think it would be. Hold on! Bingo likes lazing around? He's a bit of a kung fu king and he loves bamboo?! He's like a shaved panda! and our agile auctioneer's enamoured. and it just makes things of enormous strength, you know. If it can bear my mighty bulk, it can bear anybody's. who likes his bamboo as much as I do. his opponent is keeping a close eye on the competition. and it's Bingo making... a very BIG purchase. Yes, nothing gets past our sharp-eyed Southon. but first, it needs to pass his trademark "sitting" test. Ooh, that's going to chafe! How much for your pot? I will give you 20 euros. and James feels he's onto a winner. What's not to like about this fabulous pot? It probably comes from over the border, from Holland. Um, it was, I'm told, for the use and preserving of sauerkraut. and, originally, it was known as Cologne ware. from which the pottery was exported to the UK. and, remember, never trust a handle. Hold on, shouldn't you be heeding your own advice? James now has three deals to Catherine's one. and she's found just the things. She just doesn't know what they are. -What are they supposed to be? A doorstop? -So you think for the fire? -To put across, you put the log on top of them. -What are you looking for on those? 30? How does that sound? -I think that sounds pretty good, don't you? Ooh, what a sliver tongue! She bags the dog irons for just under £29. These dog irons are the business! but look at them! Really nicely cast. and it involves a big fireplace in a big hotel. to give that copper chocolate scoop a second look. -Quel prix, s'il vous plait? -Le meilleur prix, c'est 50.
and scoops up the chocolate ladle for just under £37. All I can say, with some certainty, is it's made of copper. always rely on modern things being made slightly more simply. and you'd get a very hot hand very quickly. So I need to add a handle. I need length. and she's back at the stall where she bought the dog irons. Now, this is my kind of thing. SHE LAUGHS: A big cup of tea or a big cup of coffee! -I don't do things in small sizes. Ten. You can take it for ten? -Ten? OK, I'll give you ten for that. It's a bit of fun, isn't it? and bang on her cut-price strategy. This is the bargain of the day! £8 I paid for this. And it has everything going for it. I love the colour, it's very retro, very now, very funky. and there is no way James is going to beat me on this one. and starting off at the bottom of the market has had its advantages. These Belgians are so friendly! One stall holder has just given me a punnet of grapes! but me... I'm having the time of my life. Bingo's hoping his next purchase will be checkmate! Over there, I like your chess... your chess thing. What is your best price on it? I'll buy it for 20. That's very kind, thank you. Thank you. Oh, what a polite purchaser he is! James pays full asking price of just over £16 with no hint of a haggle. Was our profit-hunting panda blinded by the bamboo? I'm always irresistibly drawn to bamboo. It's a lovely material. I like it. It has a continental cafe feel about it. you can sit down and also nourish the mind with a bit of chess. a tin advertising seat for a cheap and cheerful £8. Both our treasure-hunting titans are packing in the purchases. Time to check out the stats. each arrived with £750 of their own money. James "Bingo" Braxton was quick off the mark. leaving him nearly £496 still to spend. leaving nearly £500 in her kitty. So it's neck-and-neck for these auctioneer aficionados. Though, of course, they're playing their cards close to their chests. So, James, how's it going? -Very well, very well. How are you doing? -This place is very vibrant, isn't it? -I've only been down one side of it, though. -Where you pointed, I walked up and down. -Well done. Rich pickings there. You can say that again! Rich! I mean, I thought I would probably spend 20 euros on the first purchase. -I went straight in and I spent just over 200 euros. -Where shall I go next? Around here? -Ooh, I love a bit of kitchenalia. -Kitchenalia is roughly about there. -I'm going off to kitchenalia. throw themselves back into their Flemish forage. But hold on! Has James been playing dirty again? and I'm not quite sure about this one. He said to me kitchenalia, but this doesn't look very kitcheny to me. Bingo has this end of the market to himself. the cherry on top, the icing on the cake, the jewel in the crown. Yes, so what will it be? -How much is your little price? -What about a dix-huit price? James pays just under £15 for the print and he's chuffed! I was drawn to this lovely picture. You know, this is Holland, this is the Netherlands. This is everything on a plate here, isn't it? of this idea that things could carry on and disappear. They don't necessarily have to be centred in the middle. I like the colours, very sunny, orangey. So, his orangey, Dutch, Japanesey print brings his total haul to six. And, with that, Bingo calls it a day. his rival needs to seal some final deals fast. and she soon picks up a pair of hand weights for a not-so-hefty £24. I wanted to think out of the box and I certainly have done it with these. and they've certainly got a nice little bit of age to them. the five kilos, engraved in each one. Fantastic! I don't know who I'm going to sell them to. Maybe a gym? Maybe someone who's pretty strong. But it's certainly food for thought. for a gander at a rather unusual calendar. I saw this a bit earlier on. -I quite like it. It's a perpetual calendar, isn't it? They told me that it was a gift for a lady. You think Victorian? Late Victorian? What can you do on this? What's the best you can do? -OK. I'm not going to argue. What?! Not even a little haggling? she must think she's got something special. but I've never seen a brass one in the form of a flying goose. I would probably date this to late 19th century, early 20th century. I think I can fly away to sweet success. Ah! See what she did there? Yes! takes Catherine over the finishing line. with £750 of their own money. and soon sealed the deal on six purchases, costing nearly £269. Canny Catherine had a last-minute dash. but spent slightly more, at just under £306. time for our duo to take a quick look at the competition. Well, James, you're right about this place. -It is the business, isn't it? I've had so much fun and you look like you've had fun too. So easy to buy, isn't it? I've got to ask. That is amazing! -That is brilliant! I would have bought that. -Yeah, I think that's great. -That came with the lady behind me. Yes. What, did that come free? -She's got a very striking look. It's a sort of real 1960s sort of thing. It's a bathroom door. -I wish you lots of luck with that, James. -Do you think it's a challenge? -I hope it doesn't end up on the fire. I like your apothecary thing. This is lovely. -This has got real interest. It was a big purchase, but you don't see anything like that very often. -No, it's a lovely item, that. Um, I was told it's for chocolate. is to scoop the flat bottom. -Fancy a cup of tea? -Yeah, that's a big cup, isn't it? a coffee shop or something, using it as their display. -You had to buy furniture, didn't you? so I bought the chessboard and that. Catherine, what's your favourite item? -One of my favourites is probably the dumbbells. -Ever seen some like that? -No, I've never seen some like that. -We've just got to sell it all now. and haggle as if their very lives depend on it, as every penny counts. Back at Braxton Towers, James is feeling buoyant. Well, Tongeren... Tongeren never fails to please. with the artist's palette, which I'm rather pleased about. I remember Catherine rather liking it. Who am I going to sell that to? The chocolate scoop. Lovely piece of copper, that. Fortunately, in Brighton, there is a very famous chocolatier. I'll take it there, and I should get a good price for that. I like this. This is a classic bit of upcycling. and probably sell it to maybe a bar or... Yeah, probably a bar. Then we've got this rather nice little Dutch print. I'm going to find a buyer for that. And then, another piece of rattan furniture. The bamboo chair. Who will I sell that to? Anyway, I was pleased with Tongeren. It was great fun. But all in all, I think I have the upper hand. Mmm, I wouldn't count your chickens yet, Bingo! and she's feeling confident too. and I think I'm actually quite chuffed with the items that I bought. has a bit of a question mark hanging over him. but I'm not sure that it actually is Victorian. I think that it certainly has got some age to it. Nevertheless, it's still a bit of fun. Now, this is fun. I had to buy this as soon as I saw it. I'm going to sell this, probably, to a coffee shop. Fun all the way and big profits, I feel. is probably my least favourite item. I can't really see a big profit screaming out at me. I had to have these as soon as I saw these in the market. I think I'm going to try and find a traditional circus. or perhaps somebody who just collects circus memorabilia. The dog irons, I just think they've got a look to them. My feeling is maybe sell to a pub? A pub with a big fire? Nice country fire? The piece that I am most excited about is this apothecary cabinet. To me, it feels like it's probably Dutch. this is where the money is, and it is incredibly exciting. I think I'm onto a winner here. Yes, brave talk from the Queen of Quality! as they get their searches under way to bag the best buyers. and the money's changed hands, no deal is ever sealed. with that unusual copper chocolate scoop. famed for their extravagant cakes and cocoa creations! and owner Christine is on hand to meet him. This is the item I spoke about, and this comes from Belgium. And, um, made of copper. Feel the weight. -It feels very practical. I love this. -Yeah, somebody has lost their temper. HE LAUGHS And that's...that's interesting. Cos I believe this is part of the tempering process. you spread it out on marble and then you collect it again. -..and a way of cooling at the same time. and it doesn't necessarily have to be hot, it can also be cold. I think it's quite special, it's got some age. Definitely 1880. I would consider it, if it was the right price. I was thinking a nice three-figure sum of £110. -and wouldn't this be a beautiful thing for him...? You've done this before, Christine, haven't you? ..and I'll also give you a bar of Guntis' chocolate. Oh, you very kind lady. Thank you very much indeed. and Bingo scoops himself a profit of £38.11, plus that tasty treat. but I'm very happy with this one. with her most expensive item. I've crossed the borders into Surrey armed with my apothecary cabinet. I've come to see Glynis and she buys medical antiques. but I just hope that she'll go for this cabinet. and then doubled, at nearly £205, so there's a lot riding on this! Well, Glynis, here it is. You've seen photos. -I love that size, actually. -Yes, very neat from the outside. -..and it's probably got a Flemish influence. -This is probably 18th century, late 18th century? So it's gone through a couple of hundred years. -..handheld scale in there originally. -if they have the contents as well, that adds to it. And now you're going to whack me with something I don't like. ..somewhere in the region of between £300 and £400. -I couldn't go that low. Honestly. I was hoping that we would go more like 350. -330. And I'm really pleased that you love it like I do. and that's a very healthy profit of £125.08. to add value to one of his Belgian buys. from the foreign market is to put a seat on it. Now, I've got a nice bit of ash from the Braxton timber yard. And here, on top, it's quite a thick piece. And I'll just fashion a seat here. I think I will get more money for it. as he heads along the coast to unveil the newly-upcycled pot. He's come to an antiques shop near Hastings to meet the owner, Badger. -Now, hello, Badger, how are you? -Here's that mighty jar I spoke to you about. so that's the cabbage, sort of pickled cabbage, isn't it? -I've had sauerkraut. It's rather nice, in fact. You'll promise not to laugh, Badger? But this isn't all. and so, I've got a lovely big seat here. I like it. I had to pay some money for it. Um, I've brought it to you. I wanted to get around 50-60 quid for it. You can make a profit on this. -I might even sign and date it for you, if you like. after an enterprising bit of DIY. Never underestimate the power of pickled cabbage and upcycling. Yes, whatever you say, James! Now, Canny Catherine has been thinking outside the box too. She's hit the road and run away to the circus! She's brought her hand weights for Ringmaster John to take a look at. -Wonderful! Good to meet you, John. I've brought you a couple of five-kilo dumbbells. and I would say - I don't know - maybe 100 years old? -Do you have a strongman here at your circus? -a strongman for next year, so they might come in very handy. -So what do you think about these? Well, I think we'd certainly have a use for them, yes. -We need to talk about price. I think I would like around £60-£70 for them. How does that sound? we'd up the price a little bit? Are you game for that? -..we'd go from 50 up to 70? Right, so £70 if I'm on there for ten seconds? -OK, I'm game for that. I'm game for a challenge. There's absolutely no way I could do that. Not even going to give it another try, Catherine? Hmm! when she sells that advertising tin for £12, banking £3.80 profit. and who's just full of hot air. James has struck two deals and made himself a profit of just £71.72. having made three sales, and taken a tidy profit of £154.29. and James is yet to bank any really big bucks. so he hits his little black book of contacts. I'll bring it along. Let's see how we go. Catherine's selling spree shows no signs of slowing down. she's hoping owner Robert will give her a honkingly good profit. -It's absolutely beautiful. Hello, Robert. -What a wonderful place to be. -All I can see is just a sea of white. -There's about 3,000 here behind us. Quite a lot of geese. -You know what farmers are like! -Well, what are farmers like? -Well, let's have a look. -That is a goose, first of all. I think we could say it's a goose, yes. -That's very nice. What's it made of? -So this is made of brass. if you don't mind me saying, as a farmer! And it would be pretty tough for you to take all of these out. -So I think this is probably more of a lady's calendar. -Yeah, but what am I going to have to negotiate? -..I'm getting a bit worried about this. Somewhere between 50 and 60, how does that sound? -Oh, all right, then. 48.
and it seems there's a familiar face at the farm. -So, who's this that's come to join us? Bingo?! Are you a Bingo? I've got a Bingo too! I've got a Bingo! He's my partner in crime in this. We're going to beat him, aren't we? DEEP VOICE: Yes, we are. Yes, we are. Er, yes, not sure our Bingo will roll over quite that easily! But, before she leaves, Catherine lends a hand with the feeding time. Um, I don't think you're meant to chase them! Our goose whisperer is streaking ahead in this selling bonanza. But Bingo is poised to make a comeback, with his most risque item. to meet - no, not a lothario - but a restaurateur with a passion for art. But will the lady be his type? James paid nearly £164 for her, along with the artist's palette. -James, very good to see you. Here is my mighty door. Um, I bought this in Belgium and it has that '60s look. -Yeah, it's definitely '60s, all that mascara. I imagine that you didn't pay a lot of money for it? I paid a reasonable sum and I'm looking to get sort of £275 for it. -I've no idea where I'd put it. It'd be churlish not to accept your offer. Oh, that's really kind, Ranauld. Put it there. Thank you. Thank you. But his Dutch print doesn't fare so well. It sells for just a 25p profit. but Catherine is hot on his heels. topping up her profit purse by just over £41. Well, Bingo, that's another profit. I hope you're feeling the pressure, because I'm turning the heat up. as both our stellar sellers line up their final sales. by heading across the country with one of her quirkiest Belgian buys. I'm in Bath and I've come to see Helen. She's got a cafe, but I understand it's not an ordinary cafe. But then, this is no ordinary cup and saucer. but will it turn a giant profit? -Welcome to the Mad Hatter's. and I have brought you this rather large cup and saucer. -This is where I would love it to go. -It all comes down to. -I would offer you £30 for that. Can we meet in the middle and say 35? and that's Canny Catherine over the finish line. and he's been pounding the West London streets. I'm in Golborne Road in London with my two items of rattan. to some fellow rattan enthusiasts, much like myself. Well, surely there's no shortage of those, old chap! but will the West London dealers be enraptured by the rattan? Come on. Sit down, Dave. Feel the comfort of that chair. No cushion. It needs a cushion, doesn't it? Well, it might be all right without one, actually. -It's all right. You look settled. You look like a man of means there. -Anyway, this is my table, I love rattan. Do you like rattan? -I like anything that sells. Not a full believer? I think this would sell, because it's got colour. -..if you like them. I want 40 quid for that and 40 quid for that. -Go on, you've gone and got yourself a deal. banks Bingo £33.12 profit, and you could call it checkmate. So who will be crowned king or queen of the curio? And who will be left feeling like a mere profit pawn? let's remind ourselves of what they spent in Belgium. with the euro equivalent of £750 of their own money. Bingo Braxton made six purchases and spent £268.84. but spent slightly more at £305.75. But the name of the game is always profit. -I still haven't mastered the language yet, have you? -Well, no, not the Flemish. -Aw, what fun we had in Tongeren. -It's a great market, isn't it? -Really loved that! Good fun. -And I had good fun selling it all as well. -And you sold it well? -Well, I'm not so sure about that. -I had fun doing it. I went to a goose farm. -I went to a circus, James! That was brilliant, really good fun. Well, I went to a chocolatier. Um... The door. The door! -Shall we see what happened? -Just have it, don't I? -Please tell me it wasn't that door. -I think it was, you know. So, James walks away the winner, with just £17 between them. The big profit on the risque door helped him pull it off. I remain the Flemish champion. Tongeren was mine. We both made very good profits. and thank you to that rudey nudey door. I can't believe that horrible door came between us. when they head to a seaside car-boot sale. 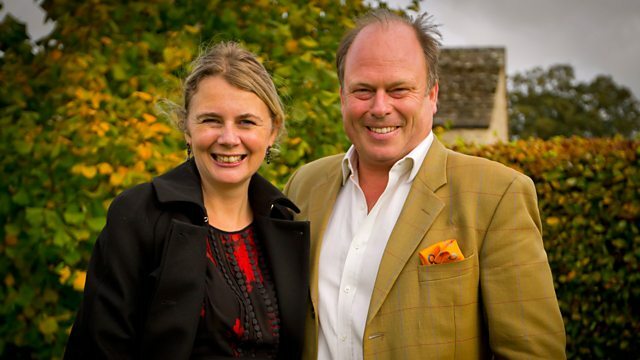 Antique experts James Braxton and Catherine Southon compete against each other in a Belgian market to see who can bag the best bargains and sell them on for a profit. James plays dirty and sends Catherine on a wild goose chase, but will she get the last laugh when she heads to the circus?